Mobile app deep linking refers to the process of using a URL for linking pages or any particular location within an app on a mobile. 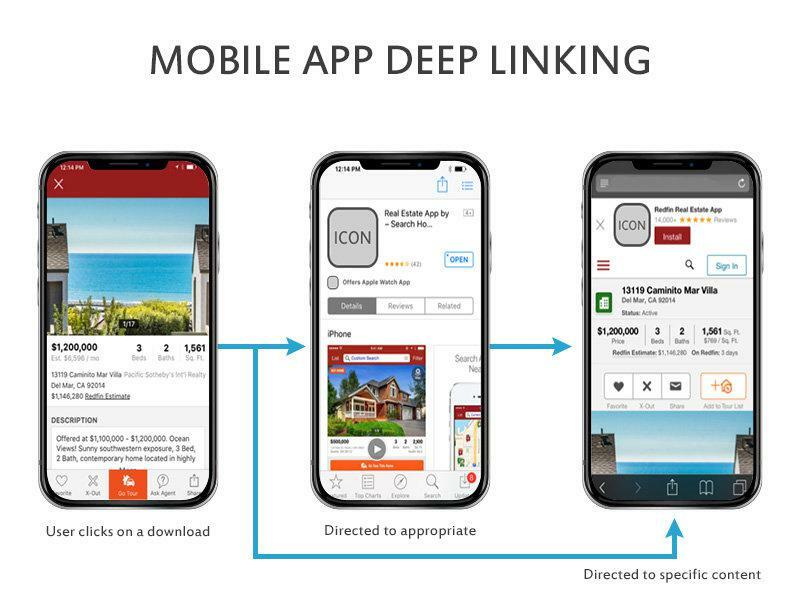 The purpose of this Mobile app deep linking is to relate the suitable information and/or content to the user, using medium like notifications, social media, Emails, SMS, etc. Mobile app deep linking can account for the user engagement. The usage of Mobile app deep linking is made obvious by the following example. If the user is surfing some particular page and from that he or she was to look into the facebook profile page of that particular company, with the help of Mobile app deep linking, it is made possible, without which the user need to take a long tour of leaving the app, then again signing into facebook, then checking the required thing. All this process, can be easily avoided by the usage of Mobile app deep linking. Traditional deep links will helps in directing the user to a particular screen or area of the app with app URL. This helps in saving a lot of time of the user for getting directed to the relevant and specific content and also it is embedded in various media like web pages, emails, social media posts, and many more. This kind of deep links can be used in various places like product ads appearing where if the user is making a click on it, then they will be directed to the page of selling the product. The disadvantage of this deep link is that the specific app need to be installed on the user’s mobile, without which it will show error. This is considered to be the best among the three types of the deep links, because this offers the additional option of pertinent information to the mobile app developers about the source of the link clicked, information about who has shared the app, what for the user want to see, and such. With the help of this deep link, the user not only get directed to the desired location, but also will experience personalized services with the most appropriate content. The best thing about this deferred deep links is that the user need not install the app for getting the necessary information. But, on clicking these links, the user will be directed directly to the play store or the app store where the user can download the app. Once, the app got installed, then the user can get the required information in the app. It helps in enhancing the user engagement and it is proven that the apps which are contained with these deep links are having almost double the visiting rate compared to others. It will provide the additional benefit of re engaging the customers who have just installed the app but did not visit the app. Also, it provides push notifications which will help the users in directing the users to the page of interest. Deep links will help a lot in encouraging the users for downloading the app. Sometimes, there might be lot number of users who will visit the website but do not install the app. Usage of deep link will help in overcoming that issue. The various marketing strategies can be enhanced using the mobile deep links, where the user are informed about the various offers and using the push notifications, they are made directed to the page of selling that particular product. Whenever the user get navigated to the page of their interest, they experienced the best service. This can be achieved using mobile deep links. Just with the help of some simple clicks, the user can get navigated to the page of their interest. The onboarding experience of the user can be enhanced with the various personalized services offered with the help of deep links. With the help of the deep links, one can experience the benefit of having a connection between the apps. For example, if the user is using any particular app, with the help of the deep links one can get directed to the other app easily. With the help of deep links, the various campaign can easily get penetrated into people where the effectiveness of the marketing strategies can be understood better using various sources like social media post, emails, ads, etc. which will in turn enhance the download rate of the app. Undoubtedly, deep links will enhance the user experience by directing to their desired pages easily. It avoid various things which will annoy the user like logins, authentication, etc. It has also got the benefits like improving the app’s discoverability, improve the revenue of the app, and increase the retention rate of the app.